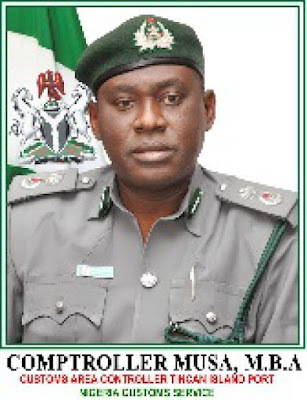 The Nigeria Customs Service (NCS)Tin-can Island Command, on Monday said it generation N162,701,701,136.83 as revenue between January and June 2018. The record showed an increase of about N32bn over the figure for the same period in 2017, which was N130,006,136, 996.36. This was disclosed in a press statement by the Public Relations Officer of the Command, Mr. Uche Ejesieme. Ejesieme said the Customs Area Controller Tin-can Island Port, Comptroller Musa Baba Abdullahi released the figures during a chat with some stakeholders in his office. According to him, the Customs Area Controller emphasized that the Command has been repositioned as the most business- friendly Port wherein all compliant declarants will be duly compensated and given special preference. Similarly, the Area Controller noted that the Command is at the verge of fully automating key seats in the Command to enable seamless operations as he made reference to the just concluded training of officers on E-Transire and NSA-End User Certificate Procedure. The Customs Area Controller also disclosed that the Command effected seizure of assorted offending items including used clothing, children toys, assorted furniture, bags of rice, shoes, handbags, used vehicles. The Duty Paid Value (DPV) of the seized items was put at N138,752,991.00. Abdullahi stated that the Command is in steady progression in all aspects of its primary functions and urged stakeholders to take advantage of the various complaints platforms in channeling their genuine grievances for necessary action. The CAC recalled that during the period under review, the Command also effected seizures of large quantity of ammunition and other military hardware during scheduled examinations and promised that the Command will not lower its guards in ensuring that such illicit consignments do not pass through to Command. The CAC appreciated the support of the CGC Col. Hameed Ibrahim Ali, his management team, the officers and men of the Command and Esteemed compliant stakeholders in TCIP for their support during the period under reference. He pointed out that the Command will continue to leverage on the already harnessed competences of its hard working personnel to carve a niche and remain outstanding in the performance of its statutory mandate. On the recurring issues of multiple alerts due to non compliance with the Fiscal Policies, the CAC while charging importers/agents on honest declarations, assured that with the take off of the “One Stop Shop” area under construction, the issue of multiple alerts would become history. The Controller stated that the Command remains committed to the change mantra of the CGC and will not renege on it’s statutory responsibilities.